I showed you a very pretty but also pretty pricey highlighter last week that had everyone sighing wistfully. I’ve realised that many higher end brands like to produce limited edition highlighter powders that are beautifully designed and embossed. It must be the metallic shine that lends to an intricate design, and it is also more attention grabbing. Yet, like many of you reading my blog I’m not terribly skilled at wearing highlighter (if you are, this is no insult, I promise!). The learning curve is less steep than learning to wear bronzer (you only risk looking like a metallic robot vs falling face first in cocoa powder) but there is a learning curve. If you don’t quite feel up to dropping RM200 or more on a product you aren’t sure about, I have a few budget-friendly alternatives for you! You may also be pleased to note that this is the most “expensive” of the 3 I’ll be showing you today and locally, you can purchase it at Sephora or Sasa stores. I believe it might be a bit cheaper in Sasa (or at least there are often discounts at Sasa) but don’t quote me except on the discounts. The theBalm Mary-Lou Manizer is a champagne toned highlight powder that can be rather strong and metallic if you aren’t careful. The texture is quite soft and brushes pick up the product quite easily. However, I do find also that it buffs out quite easily too, to a lovely gentle candlelit glow on the skin, so you can tone it down if shine makes you uncomfortable. The champagne colour will, I feel, work best on lighter skin tones. Recognizing this, theBalm has another shade (Betty-lou and also Cindy-Lou Manizer) for deeper skintones. I haven’t personally seen nor tried it so I have no comments on it. I’ll keep it short because the Catrice Strobing Duo Highlighter is a limited edition product that isn’t available anymore elsewhere, but here in Malaysia, if you look hard enough (or try Guardian online) you can still find it. I bought this on sale (as if it’s not cheap enough already! LOL!) and I like it although the powder has a fairly hard texture and it can be hard to pick up product with a brush. However, because this is a highlighter, I don’t really need that much product. While there are 2 tones of powder, it really doesn’t matter. I just swirl a brush in there a few times to pick up powder before applying where I want it to go. Unlike most highlighters this Strobing Duo Highlighter isn’t very metallic nor shimmery at all. It gives that touch of highlight, without very much shine and if that’s the sort of look you prefer, this is the one you want. I like it because I don’t have to worry I’m overdoing the shine. 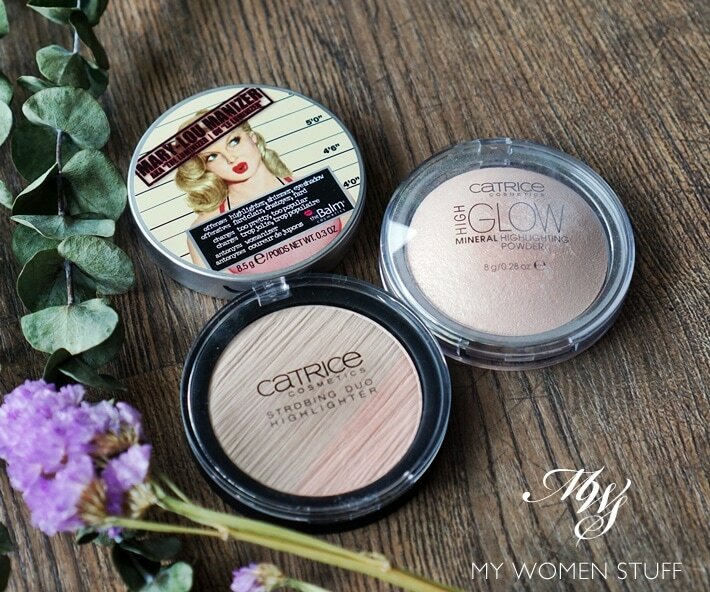 Also by Catrice Cosmetics, the High Glow Mineral Highlighting Powder is a permanent item and very affordable. I also got this on sale. Bargain! 😛 Locally, Catrice Cosmetics is only sold at Guardian Pharmacy stores. 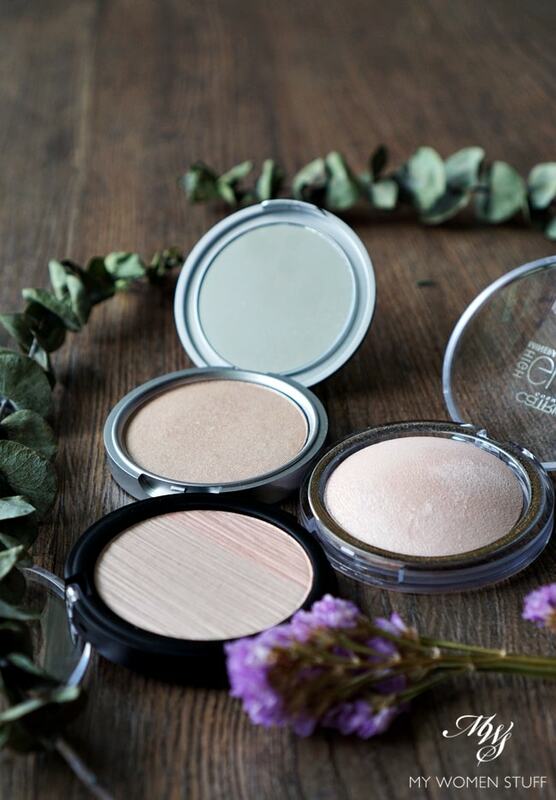 The powder comes in a rather flimsy plastic case and the powder is domed, so the packaging isn’t very sleek. The Strobing Duo Highlighter has more sturdy packaging. I do find that this lives up to its name. It does impart a fairly high glow to the skin, so if you are averse to that, use a light hand and a fluffy brush. I usually just touch my brush to the surface of the powder, because I find that the texture is rather powdery, so it’s very easy to pick up product and as a result, easy to overdo if you aren’t careful. However, with a light hand, and some gentle buffing, it gives skin a nice glow without shine. The powder comes in only 1 shade I believe, 010 Light Infusion, and it has a decidedly pink tint as opposed to the more flattering champagne tint of Mary-Lou Manizer. On medium to deep skintones, this can risk looking ashy so be warned. I do notice as well, that the shimmer and shine is more pronounced. For the price, I’m not complaining because I do think it does exactly what it says on the lid. 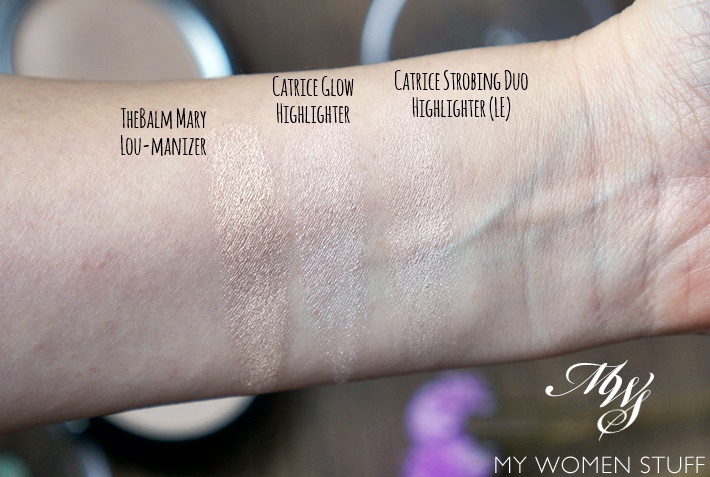 For comparison purposes, here are the swatches for all 3 highlighter powders above on me. I’m fairly light-skinned (generally, the lightest shade in all foundations) with a neutral skin tone. Of the 3 highlighter powders I’ve showed you, theBalm Mary-Lou Manizer has the warmest tone and the softest texture and is the easiest, I feel, to wear for most people. It is fairly metallic but you can buff it out without sparkles showing. The Catrice High Glow Mineral Highlighting Powder as you can see, has a cooler pink tone and isn’t as smooth. It is also quite shiny and can be buffed out. If you can get your hands on the limited edition Catrice Strobing Duo Highlighter, it has the least shimmer while allowing you to play with highlighting. It does have a harder texture so you will have to get your brush in there. But you won’t end up with a metallic shine on skin. Less is more – Seriously, don’t over do it. Here in Malaysia, you’d look like you’ve been running a marathon and sweating buckets. Not flattering. Use a primer before highlighter if you have a problem with noticeable pores or scars – Highlighter can accentuate or highlight what you prefer to keep less noticeable and a primer can help fill in and smoothen skin before you go to town with the shine. Do you use highlighter products often? 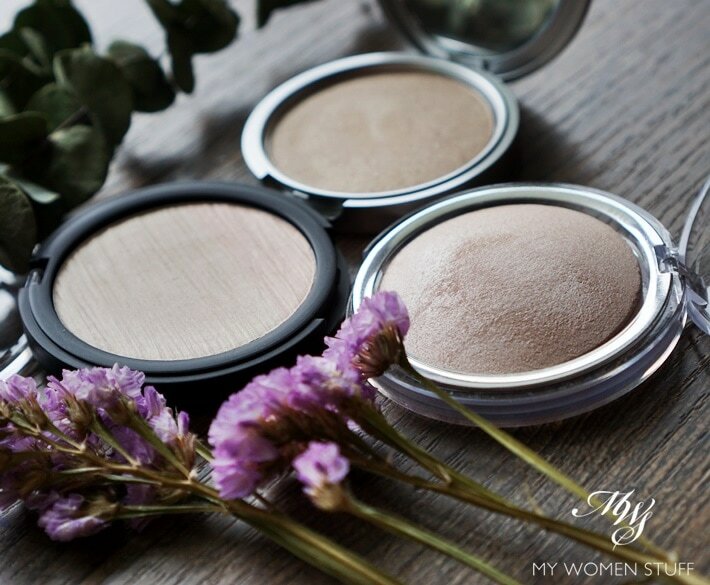 Do you have other budget or wallet-friendly highlighter powders to recommend? NEXT POST: Trying to unlock the secrets of the Chanel Blue Serum : What does it do? Yay, first comment! :3 I don’t use highlighters often cause I prefer an overall subtle glow. I own a Benefit Watt’s Up mini that’s a year old now… And it’s mostly untouched. But when the mood occasionally strikes me, I sometimes cheat and swipe on a bit of the shade Sweeter End from my Zoeva Cocoa Blend palette cause it’s such a lovely duochrome. LOL! Deborah, you made me laugh with your “first comment” erm… comment 😀 I am like you – not big on highlighters so I don’t need many. Sometimes, eyeshadow works too! I haven’t really tried anything from Colourpop to be honest. But if their highlighter works, it’s super affordable! ah that catrice strobe highlighter is definitely one of the best steal I’ve ever gotten myself! Ah but you have good access to Wet n Wild! I hear they’ve improved on quality in recent years, and some of their new stuff are so cute! Been using the Charlotte Tilbury Bar of Gold highlighter for a while now, and that’s was a pain on my pockets, like for real. Though the effect is SUPER DUPER NICE! Surprisingly, I too have the Mary-Lou Manizer but never really gotten round to properly using it, maybe it’s time to dig it up again! You make it look so good here compared to my initial thoughts when using it. the balm highlighters are my favourite. I have both mary-lou and betty-lou and both are gorgeous. didn’t get cindy-lou as it’s a little too pink for me. Thanks for the correction. Betty Lou slipped my mind haha! I’d have liked to get the palette with the 3 shades, except I’m not sure what I’d want Betty Lou for LOL! Maybe as a massively large eyeshadow?? Everywhere now they’re branding highlighters as dual use for eyeshadow so it might be great for a bronzy shiny lid colour! The Balm’s highlighter gives the effect I liked the most among the you mentioned. Nars highlighter is good too! Its price is just slightly higher than The Balm (for around rm5 as I remembered). I am still not a fan of bronzers haha. My face is really chubby and my friend suggested me to start learning how to contour my face. But for me, I just can’t master the skill well… Probably I will start to love it later. Oh yes, I’ve heard that Nars Albatross highlighter is very impressive. I haven’t tried it primarily because I hate their damn rubber packaging! >.< I wish they'd just change it. See if my bronzer techniques help you? I don’t do serious contouring, but it’s sometimes nice to have a little warmth and you can even go without blush! I am currently using the Balm Mary Lou! I bought the High Glow 2 weeks ago, and was a little bummed to be seeing some glitter in it. I tested it in the shop many times and was in denial seeing as there were many praises on the internet HAHA. However as I use it more, the glitters aren’t really noticeable on the face (just on the back of my hand), so I think I am fine with it now. Well, technically mine isn’t considered affordable but its the only one that I have & it’s the Benefit What’s Up highlighter. It’s a cream formula and I’m trying to finish it before I go out and get a new one. I almost got the Lancome one with that rose design, but I resisted! That Lancome rose was so pretty but I hear it’s just a light dusting of product on a plastic rose! What a rip off 😛 I haven’t tried Watt’s Up myself. But I hear it’s very popular! Hi Jun Ni, no I haven’t. I’ve only tried the famed Banila Co balm cleanser but it’s left me less than impressed, so I’m not that keen to try anything from the brand LOL!